During the second world war, and for a time afterwards, Wilmslow was home to a large RAF camp - RAF Wilmslow. It no longer exists and since the 1980's the site has been gradually redeveloped as housing - now known as the Summerfields area of Wilmslow, more or less a part of Dean Row. I believe that work on the camp commenced at the outbreak of war and it's role was the reception, kitting-out, basic training and accommodation of 4,000 recruits. A typical recruit arrived at the camp one week into his induction and spent 8 weeks at RAF Wilmslow before being posted elsewhere. It was known as No. 4 School of Recruit Training. Many of the recruits based at RAF Wilmslow were female; i.e. WAAFs (Women's Auxiliary Air Force - renamed WRAFs in 1949). -RAF Handforth 61MU - an RAF maintenace Unit & stores depot started in 1939 at Handforth, just north of Wilmslow. -The Handforth POW camp which operated during World War I. It opened in 1914 and housed around 2,000 mostly German & Austrian prisoners of war. -A displaced persons camp for Poles, Lithuanians, etc. located where the Wilmslow Garden Centre now stands. If you have any more details or any pictures please let me know. My name is Tom McCulloch and I attended (for brain washing, Ha ha) RAF Wilmslow in August/September 1957. Our group was led by a Cpl. Deakin with assistance of Sgt. Haslam and P.O. Cheeham. There were 19 in our group namely: McNaughton, E. Jones, Knowles, Kemp, W. Jones, McMurray, MacDonald, R. Lambert, Lomas, MacKenzie, D. Jones, Johnson, D. Lambert, Lenthall, McNeill, Lodwick, Lewis, and myself. I have a memory of 3 or 4 of us going to Old Trafford to see Matt Busby's team of Man. U. play. I am not sure who joined me on the trip, and I do not recall if the team was known as "Busby's Babes" at that time. I am interested to hear if anyone else remembers going on the trip. I do believe P.O. Cheeham was at the game. I too was a POM, but in true British manner was told that if my only source of income was my National Service pay then It was unlikely that I could afford the Mess fees. Ha ha. I enjoyed reading some of the stories told on your site, but was surprised that some referred to the cold weather, whilst I remember standing on the parade square and airmen collapsing with the heat. I was sent to RAF Goch in Germany where I completed my National Service. Gerry Fergusson writes: I was in C Flight, Wilmslow in June/July 1946 and remember well the grenade throwing (just one try) and firing both the SMLE Lee Enfield on the short range in camp and out in the country. Never did get used to the ring and bead sight. We had an older rifle, probably from 14/18 for square bashing and bull. I am fairly certain that we fired on the Bollin range so it must have been near the river. I certainly remember marching there and back on a sweltering hot day. I watched the sweat spreading from under the webbing of the man in front as we marched and no doubt mine was the same. We were all soaked and shattered when we got back. On the whole I have happy memories of Wilmslow although perhaps time has softened the view. I do not recall any of the hostility in Wilmsow that has been mentioned but perhaps the locals had encountered some of the Bevin boys who had spent some of their national service down the mines. They were no longer needed after the demob programme started but still had to complete their two years. They were as I remember, a tough lot who knew more about life than most of us. I thorougly enjoyed serving in the RAF and came to wish that I has signed on as a regular when my two years had ended. Les Downes sent in formal and informal group photos; click here to view them. Malcolm Flack ex 3151816 SAC - admires all the numerous group photos taken at Wilmslow but has not seen many around the time he was there. He has looked at those that are shown on the website (and others) without success. He arrived there for square bashing just after Easter April 1957 and was in “C” Flight and Hut 323 seems to ring a bell. His records show him as passing out around the first week in June 1957. He then went on to RAF Weeton for MT driver training and subsequently to RAF Changi on the Troopship “Dunera” for the rest of his National Service. John Davan arrived in November 1950 and has sent in a picture and recollections; click here to view them. Jim Renwick was on the permanent staff from 1949 to 1950 and says "I was of delighted to see pictures of camp. It brought back a lot of happy memories. I was a Cook at both 2 and 3 wing; this was the one used mainly by WRAF. 2 Wing was new built by Macalpines, it server airman recruits. Group Captain Young was CO, discipline was of a very high standard; all permanent staff were either on Colour Hoisting Parades or PT, depending what shift we were on. On daily Monday to Friday. My bosses were F/O Loyd, W/O Durrbridge, F/S Roe, F/S Ward, CPL Scott. Among my friends were Dave Aitken, George Mitchell, Pat MCourt, Willie Orr; we were all Scots. Brian Manning, Lofty Goodfellow, John Vernon were other cooks, I have never met any of them since I was demobbed in July 1950." Alan Holmes did his National Service square bashing in 1956 and sent in a photo along with the names and locations of all the conscripts pictured. Click here to view it. Alan Pearson was "... just in the process of writing my family history and the subject of Wilmslow camp cropped up. I like thousands of others did my square bashing there in about October of 1948. It was a great posting because I lived in Altrincham. I was quite handy at woodwork and had made a plyood box to square up my pack. One of the NCO's spotted this and asked me if I would make some more for his squad and I agreed. It seemed that he had a good supply of plywood which I later found had come from old unwanted (or so he said) wardrobes in the furniture stores. This little enterprise got me off a lot of squarebashing, made a few bob and I hope was of help to some of my fellow recruits." Philip Preece found himself at a state funeral during his basic training at RAF Wilmslow: "My stay at RAF Wilmslow began circa 15th of December 1955. I reported to RAF Cardington and spent approximately ten days there. When our Flight of 48 had assembled, we relocated to the "WAFF depot" to become D1 and D2 flights of No 1 Squadron. I was in D2 Flight. NCO's were CPL Delaney and Sgt Stevenson, the Officer being P/O Mc Ardle. After about a week the English went home on Christmas Grant, on return the Scots went on New Year Grant. Thus the 8 week Square Bashing Course drew to a close in February. But there was to be no Passing out Parade for us because of the death of Viscount Trenchard on February 7th. There was a State Funeral for the Marshal of the Royal Air Force in London. So together with contingents from Hednesford, Padgate, West Kirby and Bridgenorth, any Airman 5ft 9ins or over who did not need spectacles found themselves at RAF Uxbridge. At Uxbridge we had extra Drill Rest on your arms reverse and Route lining Procedure, in preparation for the funeral Parade. After a week at Uxbridge we returned to Wilmslow to complete Basic Training. On completion I went next to RAF Hereford at Credenhill then for the remainder of my two years to RAF St Mawgan in Cornwall." 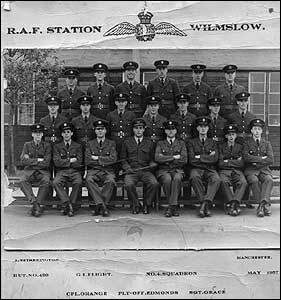 Derek Thrower found he wasn't welcome at RAF Wilmslow or in Wilmslow itself: "In the summer of 1946 I was posted to RAF Wilmslow as a partly trained new recruit from RAF Sudbury in Suffolk which closed. The drill NCO's were not happy to have us as they liked to train raw recruits to their particular ways, and we were given a most unpleasant time there. One Saturday afternoon we were allowed into town and were dismayed to find that the dislike continued there. Ice Cream ran out when we got to the top of the queue but continued when we left as did drinks in pubs and items in shops. I have often wondered why this hostile attitude existed at that time. I certainly had no wish to be there! Any explaination would be of great interest as this was the most unhappy part of all my RAF service." Jack Finegan was a young boy when the station opened: "I remember the R.A.F. stations being built during the war. I was a pupil at Cheadle Etchells School in East Avenue, Heald Green, and we were allowed out of school to help the local farmer, John Price, of Finney Lane, gather his potato and turnip crops. The Ministry of Defence had given him three weeks to clear his fields before they confiscated some of his land to build the R.A.F. stations. What was Price's farm is now a housing estate. Another depot was built in Handforth, 61 M.U. if I remember correctly. This was a stores depot and my mother worked there as a civilian clerk. 62 M.U. was built in the Stanneylands Road area and my father was employed there as a maintenance electrician and later travelling around crashed aircraft, usually German, which had been shot down during the air raids on Manchester & districts, stripping them of the electrical instrumentation. At the same time my wife's father, Ernie Wareing, was employed on the stations as a lorry driver. One day, early on in the development of the two stations, two R.A.F. lorries drove into West Avenue where I lived, loaded with WAAFs and the Sergeant in Charge went from house to house begging people to provide billets for them. We ended up with two and my brother & I had to bunk in together to make room for them. Although it was war time we had some happy times with them and quite often we would have for or five of them visiting for the evening, playing cards or just chatting." 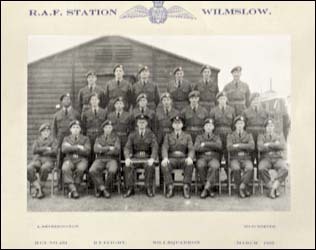 Guy Jefferson served at RAF Wilmslow & writes: "R.A.F Station Wilmslow was chiefly the home of No.4 Recruit Training Centre that originated in 1939 and was still acting as such until 1950 at least. (I very much regret I do not have the exact dates). A certain percentage of the recruits were WAAF's, which were trained here until transferring to Hawkinge in 1949. From May to July 1946 it was the H.Q of No.63 Group, Reserve Command. I have a record of it being involved with sophisticated Blue Steel bomb training from September 1956 to October 1961 although the practical side of this was done at the Avro works at Woodford. I have a large scale map of the camp site dated 1955 but whether the camp was still open at that time I know not. I did my 'square bashing' at Wilmslow in 1945/46. I did rifle firing, and tossing of live hand-grenades on a picturesque range about 5 miles from the camp. It could have been Alderey Edge but I just do not know. I have been trying to find the location of this range ever since but have had no success. If you ever come in contact with any other ex airmen that were at Wilmslow around the same time I would like to know of them." [If you know where the rifle range was then please get in touch with this website]. Guy has written more about the camp - click here to read Guy Jefferson's History of RAF Wilmslow. Jon Bleasdale wrote: "Here's a photo of my ... dad's hut/squadron at "RAF Station Wilmslow" May 1957 as part of his Nat. Service. ... (my dad is second from right on the middle row)." Alan Grose wrote: "I was at RAF Wilmslow October November December of 1950, for basic training. RAF Wilmslow was later known as Number four School of Recruit Training. Was able to equip and train four thousand airmen a year.What many people thought were Hangers were Drill Sheds (with no doors)The Spitfire was not in flying condition and was used as a Gate Gardian. The Sick Quarters included a large Infectius Disease Section.There was a large fire at the new NAAFI in 1950 and it was rebuit.Just inside the main gate was a Canteen run by the Salvation Army(no beer)The Station was about sixty percent WAAF and forty percent RAF.I was there in 1950 and 1951." Douglas Adams wrote: "I was at RAF Wilmslow as a National Service recruit during the winter of 1957/58. I have no photographs unfortunately - there was no time really as it was a simple matter of survival. Life then was harsh. Up early and drilling etc. in icy winds and rain. At one stage around 80 per cent of the recruits went down with serious flu. Several in fact died and there were quite a few who went AWOL. All I remember about the camp was the rows of huts and the parade ground." Gerald Harris remembers RAF Wilmslow as a "sausage factory": "I picked up your website while surfing old memories. I was at RAF Wilmslow in the summer of 1957. I joined up for three years on the 28 May and after three days in RAF Cardington getting processed I was sent to Wilmslow where I spent ten weeks. I was in E1 Flight. We had two D.I. 's the one I remember was called Cpl. Bentley. I remember him because we were his last intake before his demob and he cut us rather more slack than he might otherwise have done. The other one was a Wilmslow lad and the Scoutmaster of a troop in the town. HE was a lot harder, although I guess with the benefit of experience they were probably using Mutt and Jeff psychology to get that bit extra out of us. I was P.O.M. (potential officer material) because of my GCE's and got singled out for the odd dose of special 'treatment', but on the whole I took some pride in the training. It was all a bit of a blur; drill, PE, fatigues and indoctrination. They knew how to wring you out. I remember the White Swan public house (known as the Dirty Duck) and getting drunk for the first time on a pre passing out ceremony celebration in Stockport, at that time still a Lowriesque mill town with damp cobbled streets and canal bridges. It is only as I write this that I realise how little there is to remember about basic training. It was a sausage factory of unremitting grind, day after day, until you fell of the end of the production line ready for the next stage in the process. In my case that was No3 School of Wireless Training at RAF Compton Bassett, but that has no place on this website." Charles Marshall (now in Canada) wrote: "I did my basic training there from 24th July to 29th Sept 1959 so the base was still in full swing then.I notice in John Bleasdales picture the drill instructor was Corporal Orange...the same DI I had.......he was an extremely firm but very fair man. To the best of my knowledge he eventually took his commision and was a Squadron Leader on retirement.I,m sure the base was still there in operation until the early 60's. I read mention of aircraft hangers.....these were indeed open fronted buildings and were used for wet weather square bashing and pay parade was conducted in them. For any readers who were also there I was in Hut 449 Flight #H1....Squadron #1 NCO drill instructor Cpl Orange (Jaffa) and Sgt Willocks. A scary time for a lad from the highlands of Scotland but looking back it really was an unforgetable experiance which molded us for our future RAF career. Janet Roberts wrote: "I was having a surf as one does when memories start to jog. I have often wondered what became of RAF Wilmslow. I was there as a recruit to the WRAF in the Spring of 1958. After 8 weeks induction training I went on to RAF Hawkinge, then into the WRAF Police HQ at RAF Netheravon, then RAF Debden before undertaking my service at RAF Spitalgate (HQ No 2 Police District). I left the service at the end of the 3 years in 1961, met my husband who had been a National Service man in RAF signals in Aden. We were married in 1963 and still going strong. My memories of Wilmslow are the wooden huts with a coke stove, how we didn't suffocate ourselves I will never know, 6.30 am parades for breakfast, and passing out with the salute taken by the Queen Mum!" Percy Welton wrote: "I was posted to RAF Wilmslow, after kitting out at Padgate in the late Autumn of 1945. I had spent two years on deferred service, awaiting traning as Aircrew (I was classified as 'PNB1 i.e. Pilot, Navigator, Bomb Aimer - I never knew what the '1' meant) but as the war had ended I had to remuster to a ground trade. There were four Wings, three for RAFand one for WAAF at Wilmslow and I recall firing a Sten gun on the Camp short range; I also used a rifle (Lee Enfield 303?) on a longer range in (I think) Styal Woods, on the left at the bottom of the road which passes the Stanneylands Hotel. Much later I served at 61 MU --convenient for me as I could cycle home to my Mother's house at Alderley Edge!" 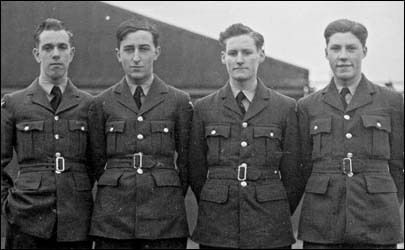 Below is Percy Welton in 1945 (2nd from left) and today. Percy also wrote: "after 'working' that comfortable Handforth posting I next received a Records Office posting to Vienna, firstly to the ex-Luftwaffe aerodrome Schwechat but then to the city itself, at Schoenbrunn Palace (AHQ Middle East Command). Vienna was then in its 'Harry Lime' period, under joint British/French/American/Russian control but within the Russian Sector of Austria, which gave rise to some interesting moments." Gordon Stringer wrote: I did my Basic Training at Wilmslow from March to June 1958. I was called up and kitted out at Cardington and we were trained up to Wilmslow from a Station that was located on the Cardington Camp, now long gone. George Harrington: "I did my National Service basic training there during February/March 1957. I certainly recall the cinema mentioned by a previous contributor. I initially reported to RAF Cardington and after being issed with kit we were taken by train from Cardington to Wilmslow station. I seem to remember a large parage square,possible two squares where we seem to have been drilled for hours. Also we seem to have spend a great deal of time doing 'fatigues'. I do have a photgraph of the intake prior to our being posted to other stations." George is the 2nd one on the left in the back row. Click here to see more group 'flight' photos. This page is large and may take some time to appear. Pictures sent in by/on behalf of Allan Bingham, Bill Brown, Derek Smith (both of them), Bill Darling, Dave Pexton, Carol Silsby, David Lockyer, Stephen Kilby and others. If you knew any of them then I'll forward any emails received. Every Minute Counts - an illustration of what to do in your free time. Quite a lot of people are now mentioned on these pages - but still a tiny proportion of all those who passed through RAF Wilmslow. If you are looking for a name here then try the 'Search Site' at the top of the page. Another site to try is www.forcesreunited.org.uk; their search facility is not easy to use and you have to join and pay to get full results. The web site www.servicepals.com is similar. The best way of accessing these commercial sites is to ignore their search facility and use Google instead: type "forcesreunited.org.uk" (or "servicepals.com") followed by "wilmslow" or the name of the person you're looking for. Mike Parnell wrote: "RAF Wilmslow closed some time very shortly after bonfire night 1962. I recall standing just outside the Sergeants' Mess with my father while he was discussing the base's imminent closure with a friend while the fire burned and fireworks popped and fizzed. 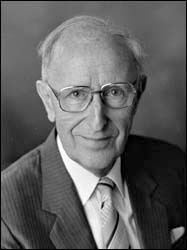 He and many others were then working on detachment from CSDE at Swanton Morley, at Avro's at Chadderton and Woodford on the Avro 748 (the Andover), Blue Steel and other programmes. TSR2 was in there somewhere too. The closure was really very sudden. It was open one day and derelict the next. I used to walk past the disused wooden huts from the married quarters where we lived into Wilmslow most Saturdays, to the cinema with friends Mark Willis and Donald Oxtaby, whose fathers worked with mine. The 1962 winter was quite unforgettable with sub-zero temperatures through to spring. I remember seeing through the classroom window the caretaker at Dean Row primary school, where I was at the time, throwing hot water down on the school's main entrance path to clear away ice. It froze where it landed! The old site could still be seen quite clearly in 1984/5 - albeit flat and grown over with grass and scrub - when I drove by it for old time sake while I was, then a serving navigator, flying the Nimrod AEW Mk3 from Woodford during its development trials." Many thanks to all the above for their information. RAF Wilmslow was clearly a substantial RAF operation with many people passing through it so I am grateful that those above (and others not directly quoted here) have been able to contribute to this small record of the times. All pictures on the RAF Wilmslow pages are copyright of those who supplied them.